Click OK to save. Now you can publish each page simply by selecting Publish. If your webhost doesn't support FTP or if you want to use your favorite FTP client to transfer the files to the server, you can use the option 'Publish to a local folder'. Click Add to add a new location to the list. Enter a name for the location a select Local Folder as type. Enter the folder where you want to publish the website files to. Click OK to save the data and then click Publish to save the files to the specified folder. Now you can take these files from the local folder and publish them using your preferred FTP utility. Publish your website to a remote FTP server. Once you have registered to a webhost, you will receive a server address, username and password. Enter this information into Web Builder by selecting: Menu->File->Publish. Click Add and select Type FTP Server. Description, enter a short description for this publish location. URL, specifies the URL of your website, this field is optional. Username, specifies the username of your FTP account. Password, specifies the password of your FTP account. Remote folder, specifies the folder (also called the root) on the FTP server where the HTML files will be uploaded to. Unfortunately this value is different for each webhost, so consult your webhost's documentation for more details! If your computer is connected to the Internet through a firewall/router, then make sure you select 'Use passive mode for transfers'. You can use the 'Test' button to determine if the specified hostname, username and password are correct. It also verifies if your firewall allows the connection to the server. If this test fails, then please verify the specified data and check your firewall configuration!!! The 'Explore' button in publish settings give you access to your published files. Clicking this button will launch the Built-in FTP Client to manage your online files. The built-in FTP client also introduces an easy way to find the remote publish folder. Simply login to your account, browse to the folder and click ‘Make Home’. 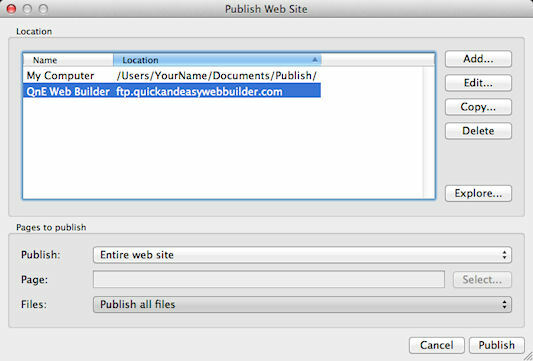 Quick 'n Easy Web Builder will now use that folder as the root of your website! To modify the permissions of any file or folder. Select the file/folder and click the 'Permissions' button. This feature is only supported on UNIX based servers. Publishes the select page, click 'Select' to specify the page to be published. Note that you can also select a folder! Publishes the select page and all of its sub pages (if any). • Make sure your ftp address (host), username and password are valid. • Use 'Test connection' to verify the specified data. • Make sure you the remote folder is correct! Consult the documentation of your host for this value! • Use the 'Explore' button to browser to the remote folder. • If the pages don't show up on your website you've probably specified the wrong remote folder. 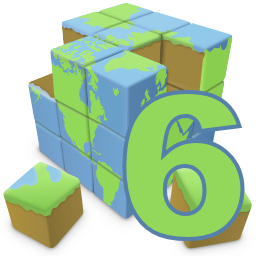 • Does your firewall block the FTP connection of Quick 'n Easy Web Builder? • If the transfer takes a long time then you've probably used (very) large images. • If you website doesn't look to be updated, select 'Refresh' in your browser multiple times! • Enable the publish log in Preferences->Publish and make note of the error message. • Maybe there is a temporary problem with your host? Check if you can connect using a FTP client. • 99.99% of all publishing errors are the result of an invalid configuration, please verify the specified data! • Did you upload the images to the web server? Make sure you did not accidently enabled 'Only publish HTML files' in the publish window. • By default Web Builder places all images in a sub folder called images. • Make sure the image names are valid, most web servers are case-sensitive and/or do not support special characters in the filenames of images. • Do your image filenames contain whitespaces or other special characters? 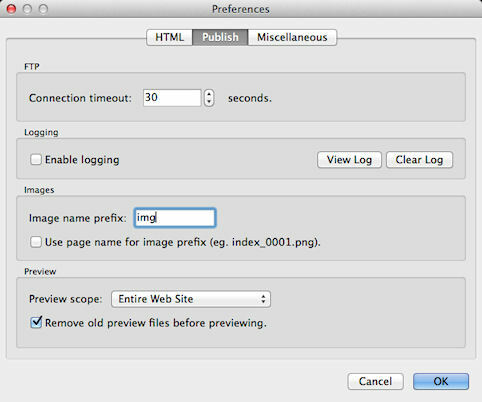 Image names with spaces can cause problems in some browsers and/or web servers, use underscores or dashes to connect words instead of spaces. • Strongly recommended: Use alpha numeric characters in filenames only! The final phase of creating a web site is publishing your pages. To place your pages on the Web, you need a Web server. Commonly called hosts, Web servers alllow you to transfer and store files, including HTML documents, images and multimedia files. Unless you own your own Web Server, you need to find a server to host your pages. but of course there are many many more! Make sure you choose a webhost which supports FTP, which makes it much easier to publish your pages from Web Builder. If you want to make sure of the advanced features of Web Builder (like the Login Tools, or Forms) then we also recommend to use Linux hosting with PHP/MySQL. Each project usually has its own profile with a unique name/description. You can add a new profile in your publish settings with the 'Add' button. After you have created the profile you can set is as the default for the project with the 'Publish to' drop down menu. The next time you open the publish window the software will automatically will select the same profile. So although you can share the same profile between multiple projects, you will usually have multiple profiles (with different names) that are used by different projects!